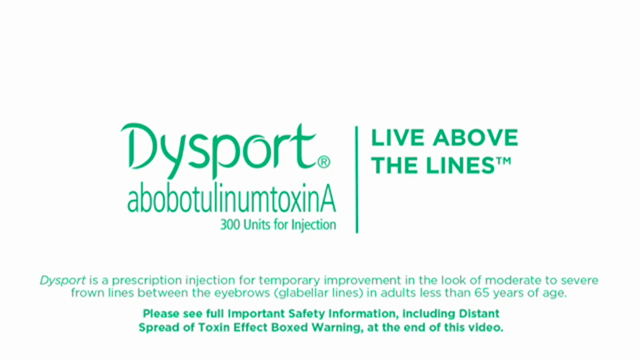 Dysport® (abobotulinumtoxinA) for injection is an acetylcholine release inhibitor and neuromuscular blocking agent indicated for the temporary improvement in the appearance of moderate to severe glabellar lines associated with procerus and corrugator muscle activity in adult patients less than 65 years of age. See what Dysport can do for your patients. More than half of subjects saw improvement in as little as 2-3 days after treatment1-3* and results may last up to 4 months.2-4† In clinical trials, overall treatment success required at least a 2-grade improvement from baseline by both investigator and subject assessments. 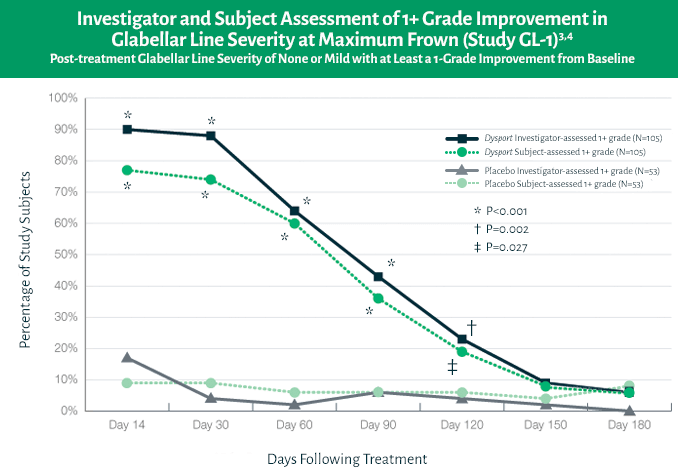 Success was defined as post-treatment glabellar line severity of none or mild for the combined investigator and subject assessments (composite assessment) on Day 30 with at least a 2-grade improvement.4 The following scale was used to assess efficacy at maximum frown: 0 none, 1 mild, 2 moderate, 3 severe. A subject had to improve from a score of 3 (severe) to a score of 1 or 0 (mild or none), or a score of 2 (moderate) to a score of 0 (none) in order to meet the requirements for overall treatment success. Three double-blind, randomized, placebo-controlled clinical studies evaluated the efficacy of Dysport® for use in the temporary improvement of the appearance of moderate to severe glabellar lines. These 3 studies enrolled healthy adults (ages 19–75) with glabellar lines of at least moderate severity at maximum frown. Subjects were excluded if they had marked ptosis, deep dermal scarring, or a substantial inability to lessen glabellar lines, even by physically spreading them apart. The subjects in these studies received either Dysport or placebo. The total dose was 50 units delivered in equally divided aliquots to specified injection sites. Additional endpoints for each of the studies were post-treatment glabellar line severity of none or mild with at least a 1-grade improvement from baseline for separate investigator and subject assessments at Day 30. GL-1 was a 6-month, single-dose, double-blind, multicenter, randomized, placebo-controlled study (N=158) to assess the safety and efficacy of 50 Units of Dysport vs placebo in subjects with moderate to severe glabellar lines at maximum frown.3 55 percent (58/105 Dysport subjects versus 0/53 treated with placebo) met the primary endpoint. As with any abobotulinumtoxinA treatment, the most common side effects are nose and throat irritation, headache, injection site pain, injection site skin reaction, upper respiratory tract infection, eyelid swelling, eyelid drooping, sinus inflammation and nausea. See below for complete Important Safety Information. Frown after 50 units, Day 10. Frown after 50 units, Day 14. Visit the before & after gallery to view the real results of actual patients at maximum frown before and after Dysport. The best way to protect your patients from counterfeit Dysport is to verify that you’re ordering authentic Dysport from an authorized distributor. Be sure to check the packaging of your product to make sure it’s authentic. There are more anti-counterfeiting measures on the packaging that aren’t listed here. Ask your distributor for more information. 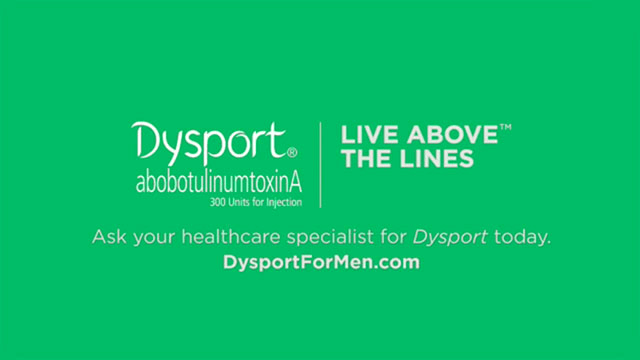 Watch to learn more about administering and reconstituting Dysport. 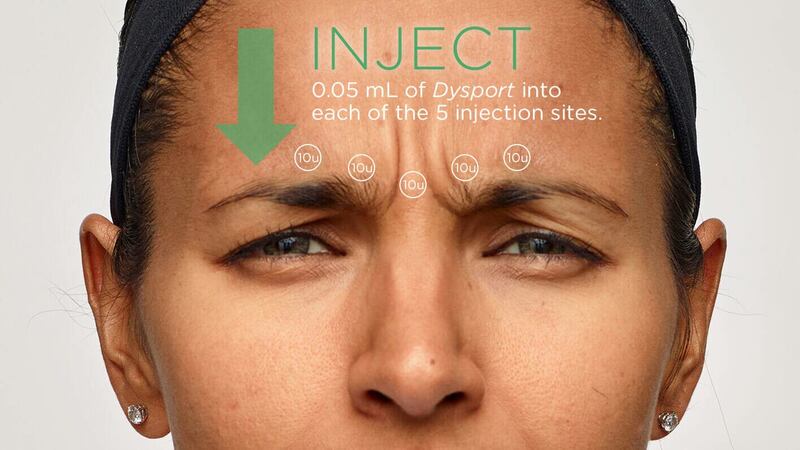 Looking for information on injecting Dysport? Visit GAINHCP.com to register and learn more about injection techniques and training. The Find a Specialist feature on DysportUSA.com makes it easy for website visitors to locate and contact you regarding aesthetic treatment. All you have to do to remain listed on the Dysport Find a Specialist feature is place an order for Dysport a minimum of every six months. Make every order count by joining ASPIRE Galderma Rewards, the program that offers specialists faster ways to earn instant savings, product discounts and quarterly rebates. It's designed to enhance patient loyalty by enabling patients to redeem their own ASPIRE Galderma Rewards points with you. Members also have access to promotional marketing materials to use within their practices. It’s a win-win! If you would like to place an order for Dysport or have any related product questions, please call 1-844-GALDERM (1-844-425-3376) to speak with a sales representative or email customer service at gss@galdermaservices.com. Dysport for Injection Package Insert. Fort Worth, TX: Galderma Laboratories, L.P., September 2017. 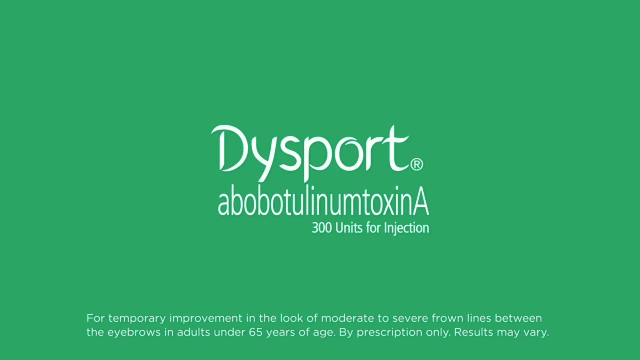 Indication: Dysport® (abobotulinumtoxinA) for Injection is an acetylcholine release inhibitor and a neuromuscular blocking agent indicated for the temporary improvement in the appearance of moderate to severe glabellar lines associated with procerus and corrugator muscle activity in adult patients ˂ 65 years of age. Immediate medical attention may be required in cases of respiratory, speech or swallowing difficulties, or serious hypersensitivity reactions. Dry eye, reduced tear production, reduced blinking, and corneal disorders, may occur with the use of Dysport. Please see Dysport Full Prescribing Information, including Medication Guide at DysportUSA.com.